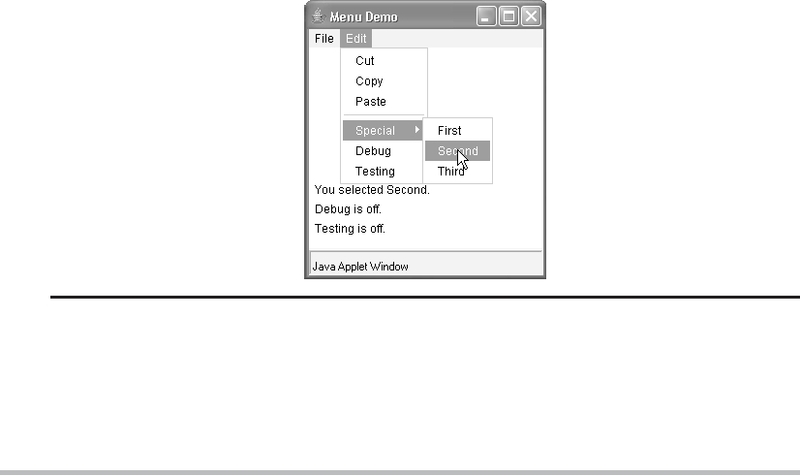 Sample output from the MenuDemo applet is shown in Figure 24-8. There is one other menu-related class that you might find interesting: PopupMenu. It works just like Menu, but produces a menu that can be displayed at a specific location. PopupMenu provides a flexible, useful alternative for some types of menuing situations. primarily used to obtain user input and are often child windows of a top-level window. Dialog boxes don't have menu bars, but in other respects, they function like frame windows. Here, parentWindow is the owner of the dialog box. If mode is true, the dialog box is modal. will subclass Dialog, adding the functionality required by your application. associated with the dialog box window.